Fruiting cherries are just as attractive as purely ornamental species and often have colourful foliage and bark as well. 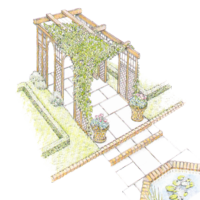 Choosing a stone tree for your garden. The right growing conditions: Plum and cherry trees grow well all over the country but require a sunny spot. Both prefer moisture-retentive, free-draining soil, though cherries are not very successful in dry sandy ground. Peaches and apricots, however, do require higher temperatures. Both can be grown in East Anglia and the South East of England trained as fans against a sunny, protected wall, but rarely do well in the North unless in protected areas of the garden or under glass. 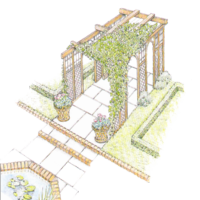 In the grand houses of the past, gardeners guaranteed success by growing them in large, unheated, 'lean-to' greenhouses, built against a south-facing wall in a kitchen garden. The temperamental apricot: Even in the most favourable soils, the quantity and quality of an apricot tree's production tends to be unpredictable. It does, however, self-fertilise, so you only need one. The apricot tree can blossom as early as February or March depending on where it is planted, and therefore its flowers are liable to frost damage. If possible, plant a tree facing south, south-east or south-west but certainly not east: if you do, blossoms frozen during the night risk being roasted in the morning sun. If frost is forecast, cover the trees with horticultural fleece. 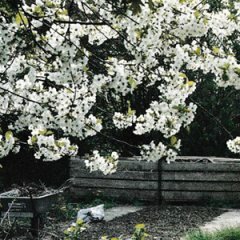 A cherry tree in a planter: As our gardens get smaller, there is a demand for small cherry trees. The most dwarfing rootstock is Colt, which reduces the height of most varieties to five metres. 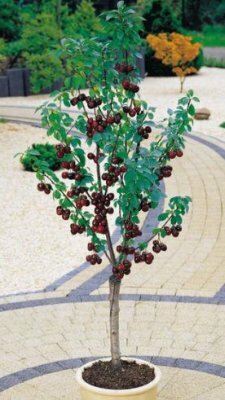 It isn't common to grow cherries and apricots in planters, but they can be happy in a large planter with slatted bottoms, rooted in a mixture of slightly clayey garden soil and a fairly sandy compost. You may have to bring apricots into a greenhouse or conservatory for the winter. 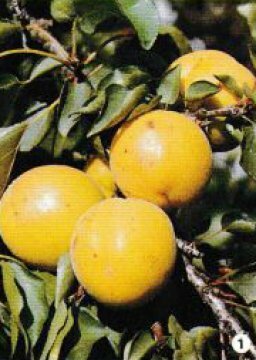 Gold Cott: A self-fertile variety with golden-yellow August fruits. It will cope with wet and cold British growing conditions. Moorpark: Large juicy apricots with late July fruit. It is not as hardy as 'Gold Cott' and needs an unheated greenhouse or a sunny, south-facing wall if grown outside. A good choice if you want to grow an old variety: it originated in 1760. Alfred: Medium to large apricots that are orange with a pink flush. Fruit from late July to early August. A vigorous tree.